In a stunning development at the beginning of grassroots Week of Action Against Monsanto campaign in Tucson, Arizona, Monsanto dropped its bid for a tax break from Pima County. See this report. The news is a victory for Pima County taxpayers whose tax dollars won’t be used to support what has often been dubbed the most evil corporation in the world. But Monsanto said it still plans to build its greenhouse in Avra Valley without tax help. That means grassroots opposition to Monsanto continues and will simply enter a new phase. 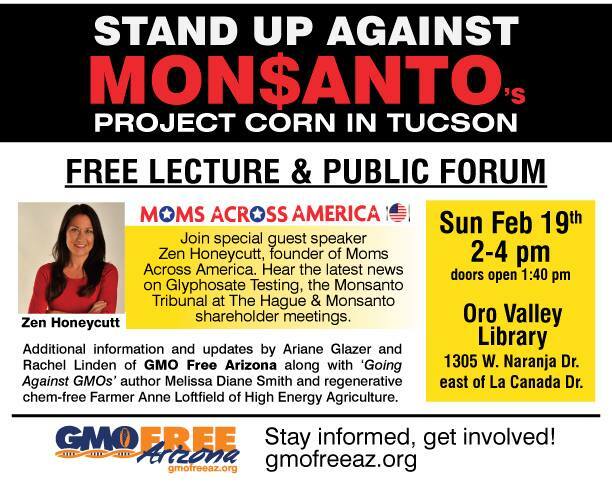 If you’d like to know why so many people don’t trust Monsanto, don’t miss a wonderful opportunity this weekend to learn from nationally known non-GMO activist Zen Honeycutt, founder of Moms Across America, who has special knowledge about Monsanto. Honeycutt will be the featured speaker covering the latest news on Glyphosate (Roundup) testing, the Monsanto Tribunal at the Hague, and Monsanto shareholder meetings at a Stand Up Against Monsanto Lecture and Public Forum from 2:00 to 4:00 pm. 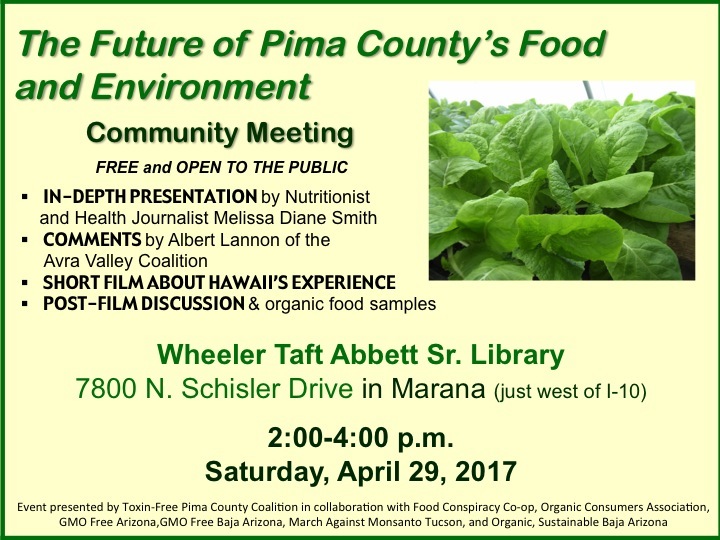 this Sunday, February 19, 2017 at the Oro Valley Library, 1305 W. Naranja Drive. 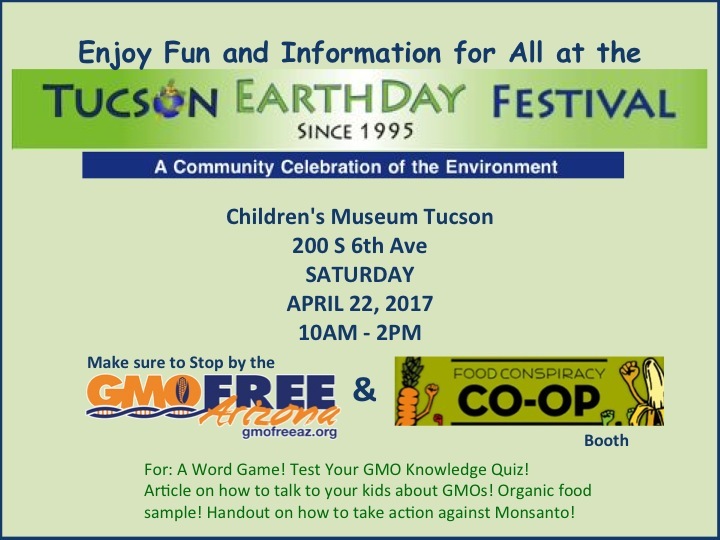 I, farmer Anne Loftfield, and Rachel Linden of GMO Free Arizona will be additional speakers at the event and will cover the latest news and details about Phase 2 of our opposition to Monsanto in our community. See the Facebook page about this event, and be sure to take advantage of this opportunity to get your questions answered and to learn information you won’t hear elsewhere. 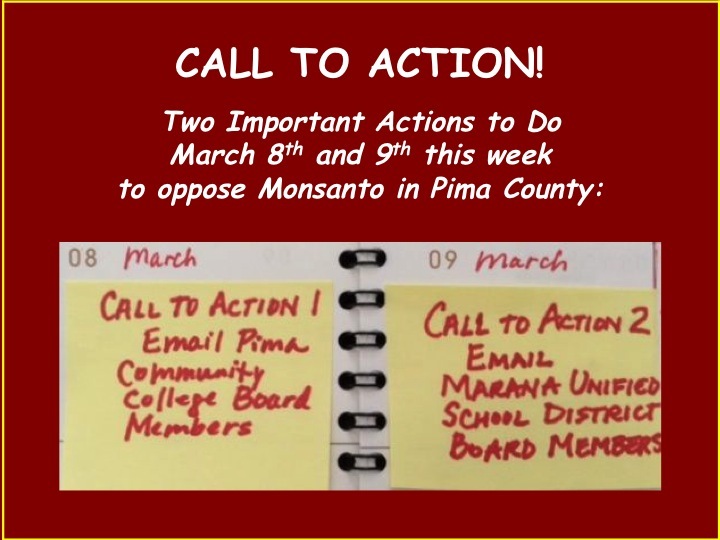 Join the Week of Action Against Monsanto in Pima County! 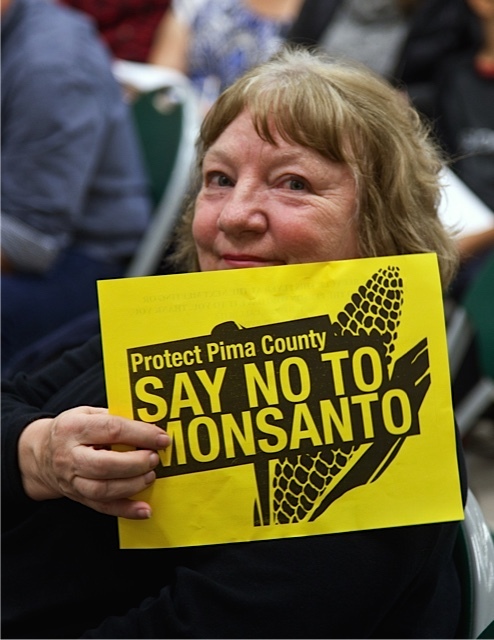 The momentum of the movement of everyday citizens against Monsanto in Pima County has been building for months. 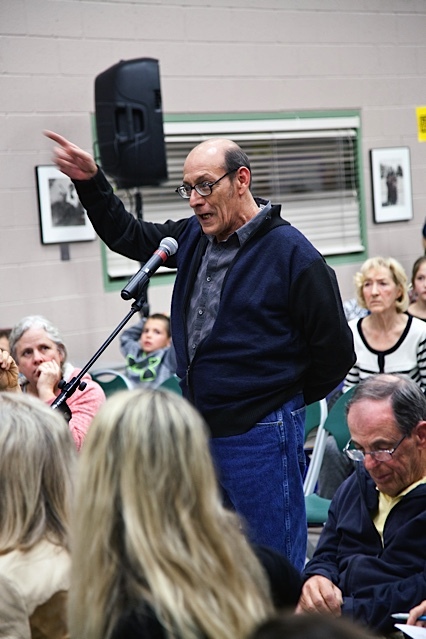 Large, often standing-room-only crowds attended public meetings about Monsanto. Educational events have been consistently packed. A showing of SEED: The Untold Story was close to sold out – with almost 500 people! – at The Loft Cinema on Super Bowl Sunday! Now, it all boils down to this week. 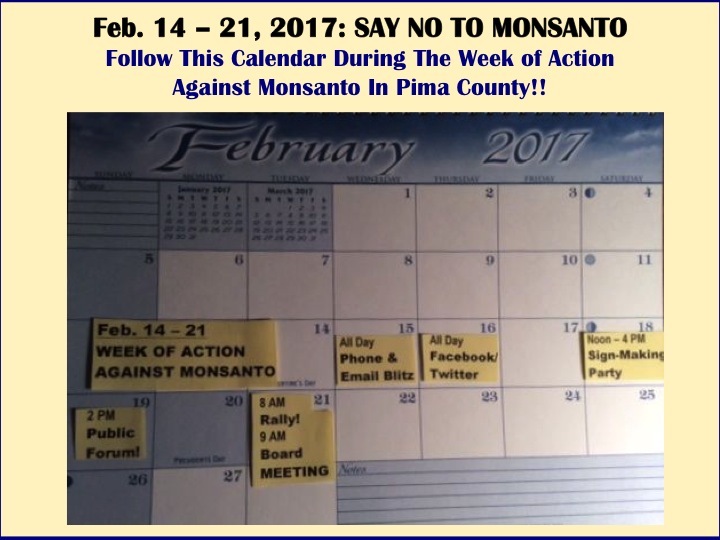 Next Tuesday, February 21, the Pima County Board of Supervisors is scheduled to vote on whether or not to give Monsanto foreign trade zone status and a tax break, and a large group of concerned citizens in concert with GMO Free Arizona have a week of action planned to say a collective NO to the supervisors about that idea. Bill McDorman, Executive Director of the Rocky Mountain Seed Alliance and former Director of Native Seeds/SEARCH, is a key subject in the film documentary, SEED: The Untold Story, which will be showing at The Loft Cinema, 3233 E. Speedway in Tucson, this Sunday, February 5th, at 2 pm — be sure to come early starting at 12:30 pm on the patio to get more information about the grassroots movement against Monsanto — and McDorman will lead a discussion following the film. Don’t miss this special event! McDorman wrote the following letter to urge the Pima County Board of Supervisors not to support Monsanto’s application for Foreign Trade Zone status for its property in Avra Valley. Please share the letter far and wide, and encourage other leaders in organizations and businesses to write letters to the Board of Supervisors or, better yet, to attend and speak at the all-important Feb. 21 board meeting!